Need a DVD video photo montage or animated CD picture slideshow created fast and locally in Orlando? We provide the service you’re looking for and have been producing slideshows for family and business events and gifts since 2003. Located in central Orlando, FL, we can take your existing photo prints and/or digital pictures and transform it into a memorable DVD slideshow for playback on any Blu-ray/DVD player or a CD picture montage for large screen projection during an event. To schedule an appointment for digital photo slideshow service email or call our Orlando Orange County location at (407) 610-2451 for same-day service availability. All production work is performed by professional photographers in-studio and your original photographs and other applicable materials are never shipped out. We provide in-house high quality photo scanning and slide scanning services to complete your project. 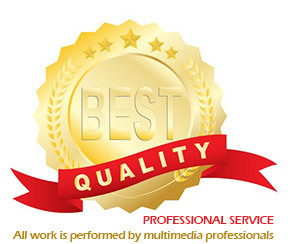 Professional in-house DVD & CD duplication service is used to produce DVD and CD discs that play on ALL devices, including Blu-Ray, DVD, CD players and computers. We only utilize high quality media to ensure disc longevity and playback reliability. We make photo slideshows with music for Weddings, Anniversaries, Vacations, Graduations, Church Events, Birthdays, Mother's and Father's Day Gifts, Valentine's Day, Family Vacations, Family Reunions, Family Tribute of someone special, Scrapbooking DVD video, Holidays, Life Stories & Personal Biographies, Baby Shower Parties, Personal events, business events, Non-Profit Organization Events and others. As low as $44.95 for a complete 30-photo slideshow! Slideshows are generally set to show each slide from 5-15 seconds. If you need specific titles to be placed in the slideshow, these can be specified at the time of an order. For corporate and business use, we can design custom motion graphics to reinforce marketing message or visually enhance the presentation. The music tracks to be used for a slideshow should be provided either on CD disc or any other portable storage digital media or storage device. We accept various audio formats, including but not limited to .mp3, .wav, .aiff, .au, .m4a, .flac, .m4b, .aac, .3gp and wma. Note that DVD & CD slideshows do not include the costs of photo scanning service and 35mm slide scanning service if such are required. Please call us to get a quick quote. We offer quick turnaround and same day service for all short-run CD and DVD duplication orders. All media is of professional grade and guaranteed to play on all devices. 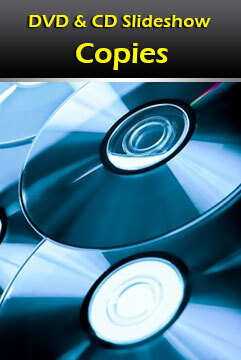 The CD & DVD duplication quotes can be obtained by phone or via email. You can email or call our Orlando Orange County location at (407) 610-2451 for same-day service availability. 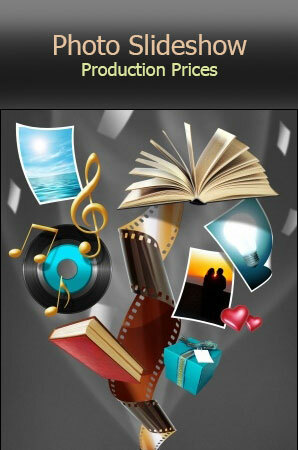 to obtain a slideshow and a CD or a DVD duplication quote. We can also provide custom printing and design for your CD or DVD media. Monotone or full color printing is available using inkjet direct-on-disc printing. All CD & DVD media with photo slideshows produced is verified for playback and data readout reliability. * Discount pricing is available for non-profit and government organizations. 1. Most of the photo montages, especially those that go back in family or business history contain photos that are scanned from prints. Whether you bring digital files of the scanned prints or the actual prints, we can manually process your photos and correct image brightness, contrast and color at additional charge if needed. If your photo montage requires the best quality from the prints you have to use for projection, we can scan your photos are a higher resolution and color latitude for high definition image representation. 2. Although we can correct the brightness and contrast of digital photo files provided to us to use for a project, some images may not have sufficient digital data to improve on lost detail in the shadow or dark areas of the photographs. However, we will do our best to recover each image as much as possible. 3. If photo prints provided are damaged or severely faded, we can provide photo restoration service for as low as $4.95 per photograph. 4. The music tracks selection is customer’s responsibility. We can use virtually any digital music file. We can also digitize music from audio cassette tapes by providing you with a tape transfer service. Once an audio tape is transferred to a digital format, it will be enhanced to achieve an optimum audio quality and embeded it into your CD or DVD photo montage. 5. Standard cross fade video transitions are included in the specified above slideshow price. However, we can add more dynamic video transitions if required at additional charge. 6. All orders include custom title printing directly on optical media. If custom design is required, we can provide a graphic design service to produce a highly customized CD or DVD packaging. 7. If you already have a digital movie file with your slideshow, we can transfer your photo montage video file to a DVD format that will be compatible with all set top and computer DVD video players. If you need specific photo captions added to some photos, make a numbered list of photo captions with corresponding photo numbers. Note that additional fees may apply. Please allow up to additional 24 hours to ship your order if no rush-on-order has been placed.